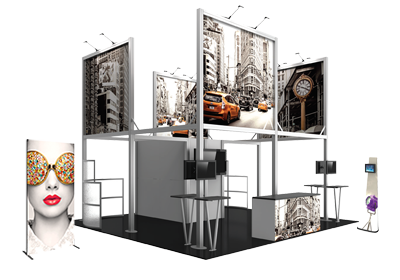 The Promo Handbook™ by Orbus Exhibit & Display Group®, offers one of the largest ranges of quality exhibit and display products in the U.S.A - from portable displays to fabric structures and modular exhibits to sign solutions and more. Not only do we provide hundreds of quality display products to choose from, but we also provide state-of-the-art graphic services, all with UNMATCHED SERVICE, SPEED AND PRICES. Orbus proudly sells to the trade only through a network of resellers and distributors. Retail pricing featured is subject to change. Larger and custom display solutions are also available. It is simple to find the essential keys to your presentation and marketing needs with Orbus. With a large selection of our product offerings being off the shelf, we are able to offer extremely quick turnaround times. We provide same day and next day shipping for off-the-shelf products and can reach most of the continental U.S.A. via ground service in one to two business days. Download our catalog or browse online at www.promohandbook.com/view-product-catalog-pdf.